Many of the guests who stay at our Cape Cod bed and breakfast take day-trips to Martha’s Vineyard. It is just a short hop on one of the ferries to a wonderful adventure on that lovely island. There are two ferries from the mainland to Martha’s Vineyard during the summer months and one that runs year-round. The Island Queen, with plenty of safe parking in a paved lot nearby, leaves from the harbor in Falmouth from late May through mid October. This is a charming pedestrian ferry that is a 35-minute mini cruise across the sparkling blue water of Vineyard Sound to the village of Oak Bluffs on the island. During the summer months you will cross with other day-trippers, folks who are staying for the week, people who have summer homes there, and families who live on the island. You are welcome to bring your bike, the dog, and the kids on board. Keep in mind that they only accept cash or travelers’ checks for tickets. The Steamship Authority travels to the Martha’s Vineyard year-round. It leaves from quaint and charming Woods Hole, with ferries to Vineyard Haven and Oak Bluffs. If you are planning on taking your car, be sure to plan ahead and check schedules and rates. You may be surprised at the cost of taking an automobile over to the island during the summer months. You may even find that it is more economical to rent a car on the island for the day. You can also rent bicycles and mopeds to get around Martha’s Vineyard, but there is also great public transportation there. Bus service is available between Edgartown, Oak Bluffs, and Vineyard Haven and you can get limited service to the other villages of Aquinnah, Chilmark, and West Tisbury. The frequency of the busses varies with the season, but the service is year-round. You can pay as you go or get daily and multi-day passes. You can board at regular stops or just wave the bus down en-route. There is also taxi service available on the island. 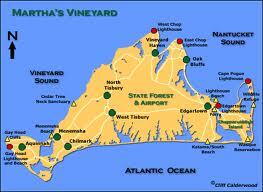 There are three main villages on Martha’s Vineyard: Vineyard Haven, Oak Bluffs, and Edgartown. All three have visitors’ information centers where you can pick up maps and other information about each village so that you can make the most of you day on the island. These are the larger of the Vineyard’s villages and each is very different and charming. 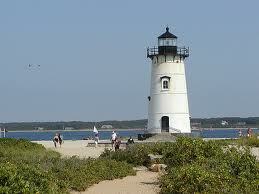 Vineyard Haven has beautiful public beaches and a year-round waterfront and harbor. Just across the street from the Steamship Authority building is the Vineyard Haven Visitor Information Center. 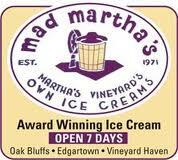 Be sure to stop in there if this is your first trip to Martha’s Vineyard. You can pick up maps there and directions to shopping, the Williams Street Historic District, public restrooms, West Chop Lighthouse, and other must-see places. Oak Bluffs is home to the famous and colorful Gingerbread Cottages and the Flying Horses carousel. The village is lively with a casual atmosphere and offers something for everyone. The Oak Bluffs Visitors Center is located near the carousel on Circuit Avenue. The folks there will direct you to public restrooms, the Gingerbread Cottages, East Chop Lighthouse, the arts district, and they can tell you what time the tours are at the Tabernacle in Trinity Park. If you like the beach, there are three public ones in Oak Bluffs. Eight miles from Vineyard Haven and 5 miles from Oak Bluffs is the village of Edgartown. This charming village was home to sea captains during the wealthy whaling era and may of the elegant captains’ houses still stand. You will love the white picket fences intertwined with rambling roses that you see all around the village. Stop by the Church Street Visitors Center where you will find public restrooms and lots of information about the village. Some interesting places to visit are the Old Whaling Church, the Edgartown Lighthouse, and the historic Dr. Daniel Fisher House. If you like to shop, you will love all the lovely boutiques in the village. For the beach lover, you will find several public beaches here but watch out for the rough surf. From the harbor in Edgartown, you can take a ferry just across the way to Chappaquiddick Island to visit the Mytoi Oriental Gardens. Created by Hugh Jones, this Japanese-style garden is nestled within the island and sheltered by a pine grove. There is no Japanese translation for the word “Mytoi.” Mr. Jones chose to use this spelling to name the garden as he always referred to it as “my toy.” This garden includes a pond with an island that is accessed by a raised bridge. The pond is home to turtles, frogs, and goldfish. There is a footpath leading to a stone garden and a salt marsh. This beautiful and tranquil garden is open all year. The villages of West Tisbury, Chilmark, and Aquinnah are smaller and more remote but charming none the less. Aquinnah is the western most village on the island and where you will find the beautiful, gray, Gay Head cliffs that are a great attraction for visitors. It is also home to many of the island’s original residents, the Wampanoag Native Americans. West Tisbury is a quintessential New England village with its white church, old mill, Alley’s General Store, and post office. There are art galleries to explore and a glass blowing studio. Chilmark is largely rural and quite picturesque with tree lined country roads where you will see sheep grazing in stone wall bordered fields overlooking the ocean. Located within Chilmark is Menemsha, a quaint fishing Village and harbor. If you are visiting Martha’s Vineyard for the first time, you may want to take one of the sightseeing tours of the island when you arrive. Tours originate in both Vineyard Haven and Oak Bluffs but they are seasonal so you may want to check with the Martha’s Vineyard Chamber of Commerce for more information. When planning a visit to Martha’s Vineyard, be sure to keep in mind that it is a seasonal island and that some restaurants and attractions are closed before Memorial Day and after Veterans Day. This is just one of the many splendid adventures that is just a day-trip away from our bed and breakfast.